In the run up to their exhibition snap! at Bankside Gallery, 2-7 May 2012, South London Women Artists have been delivering art workshops to school children in the Bankside area. These workshops will encourage children to develop their own game of giant snap! to be played on Thursday 3 May at Bankside in the open air. St Joseph’s Catholic Primary School have been busy sketching the place where they live and go to school, the vibrant area of Bankside. Artists from SLWA have been learning about the area from the children, looking closely at the wealth of inspiration on their doorstep, from a world famous market and amazing architecture to a river and a beach. The children are using these sketches to produce their own set of large snap! cards to play Bankside snap!. Bankside snap! will be launched at the Bankside Gallery on Thursday 3 May between 1.45 pm and 3pm. The giant snap! cards will be A3 in size and the children will work co-operatively to develop their observational and motor skills. They will also have time to play imaginatively outside and explore different ways of making card houses and shelters. Snap! at Bankside Gallery is South London Women Artists second major exhibition of members work and will be staged around a display of archived Women Artists’ Diaries from the collection at Goldsmiths University of London. SLWA will be launching their own women artists’ diary at the private view on Wednesday 2 May from 6-9pm. There will also be a programme of talks and events during the exhibition. South London Women Artists (SLWA) was launched by the Friends of Dulwich Picture Gallery in June 2008 to provide support to the enterprise of women artists living or working in South London. Since its launch the group has expanded its membership to 100 artists and has held a number of successful exhibitions. In addition to offering an online presence, SLWA supports its members through workshops, critiques and talks and provides a forum for discussion. It is an inclusive community with a wide range of members from all backgrounds, which aims to help women artists to raise their profile and to develop their art and entrepreneurial skills. SLWA also offers an education programme to the community. Althea Greenan is curator of The Women’s Art Library at Goldsmiths University of London. Althea has worked within The Women's Art Library since 1989, when it was primarily an artists' organization collecting and archiving its members' slides and publishing a magazine which appeared under the title 'Women's Art Magazine' and later 'Make, the magazine of women's art'. The Women's Art Library ceased operating as an arts organization in 2002, but the collection is now held at the Library at Goldsmiths University of London where it remains accessible to the public and continues to collect documentation on women artists. Althea's various roles within the Library included a decade of writing in the magazine and managing the research resource, which was gifted to Goldsmiths. She continues to work with the collection as part of the Library team, with a particular emphasis on developing The Women's Art Library collection. She facilitates a range of events and projects that center on the collection, including a writer's residency in 2007 and the forthcoming WAL/Feminist Review Research Bursary in spring 2009. Dr Lara Perry is Principal Lecturer in Humanities at the University of Brighton. One of her current projects is to explore the histories of feminism and art curating, and she is co-editor of a book on the subject (with Angela Dimitrakaki) titled Politics in a Glass Case, forthcoming from Liverpool University Press. Lara is also part of the Leverhulme funded International Research Network on Feminism and Curating, which is hosting a symposium on feminist and queer curating - Civil Partnerships? – at Tate Modern on 18/19 May 2012. Sarah Sparkes is an artist and curator. Sarah is currently engaged in research centred on the Harry Price Library of Magical Literature. She is interested in magic in the domestic and everyday, both as supernatural force and as legerdemain. Her work explores the belief systems we adopt and the powers we invest in the material to protect ourselves from our deepest fears. Sarah co-runs the arts and interdisciplinary project "GHost" and hosts an annual art and performance event "The Chutney Preserves" for Camberwell Arts Festival. Recent exhibitions include: "GHost" at the Folkestone Triennial, London Art Fair, "The Infinity Box" a site-specific work made for the Belfry of St John Bethnal Green, London, "Cult of the Harvester at Supermarket Stockholm”, "Fate and Freewill" at Riverside Contemporary Art Space, California, USA. Did you spot our headline news board? 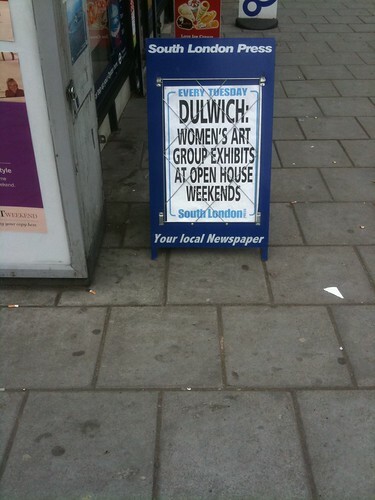 Southwark News has featured our next group show in Dulwich. Check out the article bellow to learn more about what we're doing and come to our Private View on 3 November at 8pm in the Dulwich Library! Please take a look at Gabrielle Bradshaw's website, whose painting is featured in the article.